Walk around the town and the hand of the Tetbury in Bloom team is all around you - from the beautiful public flowerbeds along London Road, New Church Street and outside the hospital, to the planters and hanging baskets in the centre of town; from the churchyard at Saint Marys', to Anniversary Gardens and the front of Old Coombe House. At this time of year, I think that it is also important to pause and reflect on our successes and to thank our many supporters. The cold weather at the beginning of the year ensured a wonderful early spring display of daffodils followed by my favourite, the tulips. On the whole it was a good summer; the begonias and geraniums in the summer hanging baskets created stunning displays with huge balls of flowers and the bedding plants in the town flowerbeds lasted well into October, providing a wonderful splash of colour. The seventh Open Gardens Day on 31st July was the biggest and best yet, with visitors coming to Tetbury from far a field; many promising to return to hit the shops or attend one of the many annual events. A very special thank you to the gardeners: Rachel Moody, Pam Bird, Jeremy and Sue Townsend, Val Smith, Polly Reuter, Alan and Julie Simcock, Lance and Pat Vick, David Hollister and the residents of Five Trees Close and our very own Sue and Stephen Hirst. We were delighted to be invited to the Womens' Institute September meeting, with guest speakers Finn and Nicki Spicer from Malmesbury's River Barn Garden. Thank you to the WI for their kind donation of the profit from the café at the Open Gardens Day. The annual Race Night on 29th October was lots of fun and another big success. Thank you to the race sponsors: Artique, Filly's, Highgrove Enterprises, Martin White Jeweller, R and J Pearce Electricians and Plumbers, Sentiments, Skeins of Tetbury and Yellow Lighted Bookshop. After over a decade, out in all weathers, Mike Kniveton retired from Tetbury in Bloom - we thank him for all his hard work and support and hope to see him and Joan at future 'In Bloom' events. 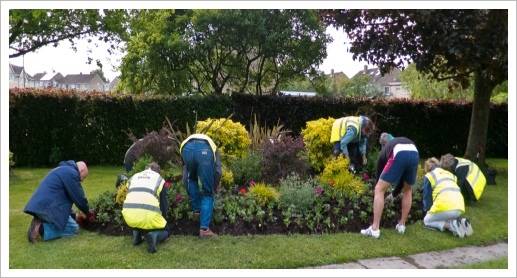 The flowerbeds at the bottom of London Road looked particularly impressive this year, thanks to Mike's special care. We are delighted to welcome Charles to the team. Thank you to Highgrove Enterprises for their continued support and sponsorship in supplying many of the summer floral displays. We are also extremely grateful to Tetbury Town Council, Tetbury Upton Parish Council, The Feoffees of Tetbury, St Marys' Parochial Church Council, The Rotary Club of the South Cotswolds and also Artique, The George Veterinary Group, R & J Pearce Ltd, Scentiments, The Tetbury Tailor and the many residents and individuals for their generous donations. Until next year. Merry Christmas and a Happy New Year from the Tetbury in Bloom team. Once the dormant season is well and truly upon us, it is time to plan ahead. Whilst the bedding plants, with their summer colour, have long gone and the perennials have largely died down, many may think of November as a dreary month, but not Jane Bell, one of the Tetbury in Bloom helpers. For her and the team it is a busy month; a time to reflect on the great summer planting and to plan ahead for the spring. We are busy bedding down for the winter, tidying up the flowerbeds. There is also still the opportunity to move poorly placed plants and divide overcrowded perennials while the soil is still warm. It is a time to take stock and appreciate the shapes, colours and textures of the structural plants that form the backdrop to the more showy summer and spring displays. Plants such as berberis, choisya, spiraea, phormium and euonymus. As Jane points out, it must be a funny sight for passers-by to see the team in their high-visibility jackets, with their heads down and bottoms in the air, digging holes. (Kevin, my husband, calls it "the Tetbury in Bloom salute"!) At the end of planting, Jane usually has a blister on the palm of her hand but a huge feeling of satisfaction and anticipation as she looks forward to the display to come in a few months' time. Last month's Race Night was another success. Thank you to everyone who attended and particularly to the sponsors: Highgrove Enterprises, Artique, R&J Pearce Ltd, Scentiments, Skeins of Tetbury, Yellow Lighted Book Shop, Filly's and Martin White Jeweller. Thank you to Jane and all members of the team - it may be hard work but it is also lots of fun. We hope that the spring displays bring as much pleasure to you as they do us. When I asked the Tetbury in Bloom volunteers for their favourite flowerbeds Frances and Ann both responded with the "Anniversary Gardens". Anniversary Gardens is in Eccles Court, which runs between The Chipping and The Ferns. It was originally part of the grounds of the old Sir Williams Romney school, now the doctors surgery. "A small haven of calm, character and colour" is how Frances describes it. "Just a two or three minute walk away from the bustling centre of the town and yet here traffic sounds are left behind and birdsong and peace dominate. Almost like a 'secret garden', it nestles between two majestic Cotswold stone walls and the Coach House." There are several borders planted with perennials, which give year-round colour, but for Frances the beginning of the year is the most inspirational, with a drift of white snowdrops appearing through the rosa regosa beds providing welcome light and colour after the darkness of winter. These are followed by glorious yellow tete-a-tetes and other daffodils creating a joyful spring greeting. The heucheras provide colour throughout the year, contrasting with the vivid geraniums in the summer. The garden is also fragrant at times with roses growing up the walls, and the pergola and the lavenders in the rosa regosa beds and encircling the Rowan tree. "I am constantly surprised at how many Tetbury residents are unaware of this garden because it is not on a main thoroughfare but I urge you to visit it through the seasons to capture its varying moods and maybe enjoy a few moments on one of the two wooden seats." Working with Tetbury in Bloom since 2009 has enriched France's retirement "giving me wonderful new friends, a twice weekly work-out and a constant learning opportunity!" At the time of writing, tickets were still available for Race Night on Saturday 29th October - our annual fund raising event. All profits go towards Tetbury in Bloom and Christmas in Tetbury projects. Tickets cost £5 per person and can be obtained from Sue Hirst on 504213. More details can be found on our website www.tetburyinbloom.org.uk or look for our advertisement in this month's Tetbury Advertiser. Do remember to visit Anniversary Gardens! It never ceases to impress me how much people care about Tetbury and how hard they work to maintain it for the benefit of us all - the Tetbury in Bloom volunteers are no exception. 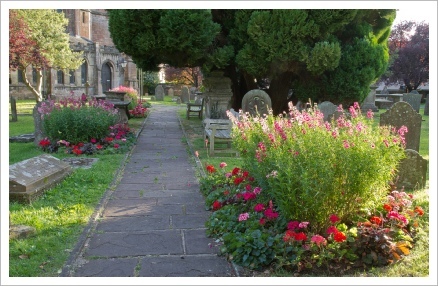 Dee joined the Tetbury in Bloom working team some five years ago and her favourite area is Saint Marys' churchyard. This area is a joint effort with the Council team keeping the grass under control. Dee says "I take great pleasure in making Tetbury proud of itself. It says to residents and visitors 'I am loved'." She explains that, "as I wander through other churchyards, in other towns and villages, I am often saddened by their state of neglect. It is not a criticism as I am well aware of dwindling congregations and the lack of funding, but in our churchyards there is a feeling of care and respect." She goes on to say that "There is great variety in this oasis, from the magnificent trees, wildflowers and more formal flowerbeds, to the less formal corner. It is, of course an ongoing battle against the weeds, the weather and nature but we do our best to keep it looking good. We hope that it gives everyone a sense of peace, from the bride and groom and those wandering through and pausing for a while and taking advantage of the many benches, to relatives of those who lie in the churchyard." I hope that you enjoy the results too. On 31st July, in excess of 350 people took the opportunity to visit the beautiful private gardens as part of the sixth Tetbury Open Gardens Day, making it the biggest event yet. Visitors came from across the Cotswolds and as far away as the USA, many of whom said they will return sample all that Tetbury has to offer. A heartfelt thank you and a very well done to everyone involved including the wonderful gardeners (Pam Bird, Rachel Moody, Polly Reuter , Alan and Julie Simcock, Val Smith, Sue and Jeremy Townsend, Lance and Pat Vick, the residents of Five Trees Court, and our very own Sue and Stephen Hirst); the ladies of the Womens' Institute for the delicious homemade cakes and for serving the refreshments; the Feoffees for use of the Market House; Dee for the bunting that gave the Hall a celebratory feel; and our Mayor, Stephen Hirst for providing his cakes as unique and highly sought-after raffle prizes. All profits raised will go towards Tetbury in Bloom projects and enable us to continue our good works. If you are interested in opening your garden in 2017, or being involved in such a great event for Tetbury, please contact Sue Hirst at sue@tetburyinbloom.org.uk or on 01666 504213. 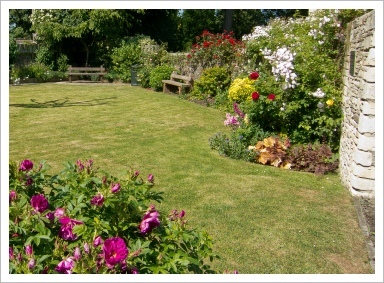 When I asked my husband, Kevin, for his favourite Tetbury in Bloom aspect, he immediately replied the Open Gardens Day. Why? I asked. Because so many people turn out to show us their support he replied. For gardening enthusiast and experts alike Open Gardens offer the ideal opportunity to enjoy a pleasant afternoon discovering gardens not normally open to the public. Better still, it provides the excuse to indulge in a cup of tea and homemade cake, and to meet up with friends. Tickets will be available on the day from the Market Hall or from any of the gardens. Delicious home-made refreshments will be served in the Market Hall. Thank you to the ladies of the Womens' Institute for organising the refreshments and to the Feoffees for use of this iconic building. All proceeds go to towards Tetbury in Bloom projects, for the benefit of the local community. 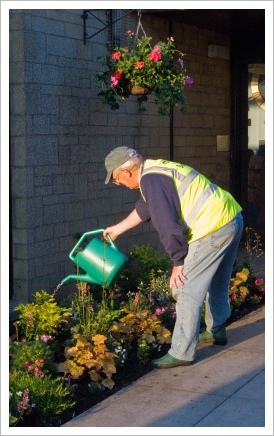 For more details, or to download a map in advance, please visit our website at www.tetburyinbloom.org.uk. Alternatively, look out for the posters around the town and the advertisement in this issue of the Advertiser. A very special thank you to all the gardeners. Anne has been a part of Tetbury in Bloom for four years. She is one of the team, out most Tuesday and Thursday mornings, tending the many flowerbeds. Anne enjoys the variety of flowers in the many London Road flowerbeds. Because they are close to her home and on a main road, she passes them on a regular basis and can check on what is growing and take pleasure in how they look. Who can blame her? She doesn't have a favourite season. The flowerbeds look impressive all year round. From the snowdrops, crocuses, delightful miniature "tete-a-tete" daffodils and the violets under the beech hedge - which brighten even the dullest of spring days - to the brightly coloured tulips and the willow tree coming into leaf, followed by the brilliant pink and red geraniums, begonias and antirrhinums from now until September and finally chrysanthemums, fuchsias and penstemons flowering into the late autumn - there is always something to see. This spring Anne particularly enjoyed seeing crocuses, cyclamen and daffodils under the tree at the entrance to Priory Way. All this would not be possible without the on-going sponsorship of Highgrove Enterprises, Tetbury Town Council and The Feoffees together with donations we have received this year from Artique, The George Veterinary Group and The Tetbury Tailor. Thank you to Anne and the entire team for maintaining all the flowerbeds. Sue Hirst, Chairman and the creative inspiration and driving force behind Tetbury in Bloom, tells me that her favourite display is, and always has been, the flowerbed on the corner of Braybrooke Close and London Road. "I love the different shapes and textures we have created and the overall pastel colour scheme, which gives a totally different look to any of the other flowerbeds in the town." Such successful naturalistic planting requires careful planning. A limited pallet creates the biggest impact. One or two large plants give height and interest. 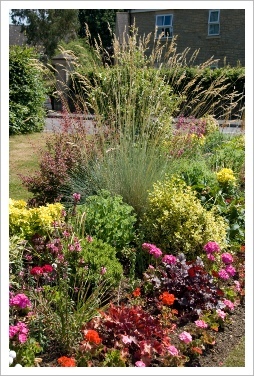 Evergreen plants add structure and the grasses add an extra dimension of movement and texture. The Braybrooke flowerbed is planted with spiky variegated phormiums, soft grey-leafed grasses and foxtail lilies that give real height in the summer. Yellow-leafed choisya, together with lots of yellow variegated euonymus add structure and contrast well with the long flowering perennials, such as penstemons, hardy fuchsias, cranesbill, erodiums, sedum and phlox, in varying shades of pinks and mauves. Dark leafed heuchera, at the front of the border, continue the colour scheme. The addition of spring flowering bulbs and summer bedding (also in pinks and mauves) complete the look. Whilst the colour scheme may not be so bright as other town centre displays, it is equally as eye catching. We hope that you enjoy the results as much as we do. One of the best things about Tetbury in Bloom is how the community has supported us in what we do, and how some residents have taken ownership of what we have produced. For example, Mike helps with watering the London Road flowerbeds and he and others (Frances, Ann, Jane, Dee, Janet and Emma) have joined the team, out every Tuesday and Thursday morning throughout the year, in all weathers, to care for the displays. Mel, our Treasurer's favourite memory is of laying out the five-sided star, now synonymous with the roundabout at the Cirencester entrance to the town. Having left school many years ago, you tend to take for granted the things you have picked up over the years; creating a symmetrical five-pointed star was perhaps one of them! Mel remembers marking out the shape in left over lilac paint. Living so close, all the plants were delivered to the Maslin home, providing a wonderful welcome on Mel's return from work. She says, "At the time it was like 'our' flowerbed!" Kev and I joined the team on the day we started the planting and so the roundabout holds special memories for us too. In the beginning, the planting in each of the points was identical but Mother Nature and time mean that each is now subtly different, with variations on a theme, including: red berberis, green leafed choisya, golden spiraea, yellow anthemis, orange kniphofia "Tetbury Torches" and crimson penstemon. Tetbury in Bloom's Sue Hirst designed the bed and chooses all the plants within it, not only for their colour but to roughly graduate in size towards the tips of the star. It is a very clever design. Today, the roundabout is the jewel in the Tetbury in Bloom crown and, I challenge you to find a more beautiful example, with sustainable planting, anywhere in the country! After more than a decade writing these articles, I thought I would ask others in the team to share their favourite Tetbury in Bloom stories. When I first asked Ange Morrissey, I was surprised to learn that her favourite initiative was the memorial flower bed and fernery at the western end of Saint Marys’, underneath the magnificent East window. Why is this? The answer is because, not only because it looks good all year around but because of the challenges overcome gardening in the shade – reduced light levels, temperature levels that are not as extreme as in the sunshine and the damp conditions caused by moisture being slow to evaporate. Ferns are ideally suited to this moist, shady spot, protected from wind and hot sun by the walls of the church and the canopy of the existing trees. The bold forms of ferns, their fine foliage and the different, subtle, shades of green are a marked contrast to the typical colourful Tetbury in Bloom flowerbeds - take a look for yourself. A neighbour recently told me how the beautiful daffodils, in bloom in January, on the bank of the West Street car park (another Tetbury in Bloom initiative), remind her of her childhood in York and the flowers alongside the city walls. We have already planned ahead and are now taking orders for our summer hanging baskets which comprise easy-care, trailing begonias in pink, red, orange and apricot shades OR you can choose baskets which comprise a selection of vibrant trailing geraniums. They will be delivered to your door by arrangement during the second week in June; all you need to do is to install them, water them regularly and give them the occasional feed. Details can be found in our adjacent advertisement or on or website www.tetburyinbloom.org.uk All profits raised help go towards In Bloom projects. If you purchased our hanging baskets last summer and still have the empty containers, we’d really appreciate their return so we can re-use them for this year. To arrange collection, please ring Sue Hirst on 504213. Walking around Tetbury during the Christmas break, I was surprised to see kniphofia - "Tetbury Torch" - in flower in the fire station and Priory Road flowerbeds; roses outside the Brewery Lane public conveniences; blossom emerging on some of the Pyrus Chanticleer (ornamental pear tree) screening the West Street car park and narcissus in full flower on the Bath Road. We have witnessed all four seasons all at the same time! "Tetbury Torch" is an unusual, medium-sized, clump forming, deciduous perennial, with deep green, grass-like leaves; its apricot and yellow pokers usually flower in late summer and early autumn! Pyrus calleryana Chanticleer is amongst the first to come into leaf in the spring, when its leaves emerge together with a pretty white flower. Regardless of the unseasonable weather and the heralded cold-snap to come, the Tetbury in Bloom team are out and about tending to the floral displays to ensure that they look their best. It is important to keep on top of things. The main borders have been tidied and cleared of leaves. I look forward to seeing what delights are revealed in the weeks and months to come.